Rice Management Company's Ceci Arreola presented current plans for the Ion, formerly the Sears Building. She also outlined possible future development on the remaining Rice acreage to become part of the Innovation District. See presentation here. Marie Hoke, Central Houston, presented plans for TXDoT’s North Highway Improvement Project including bridges and cap parks for streets connecting Museum Park with Midtown. Caps included in the project are the Fannin Cap, Caroline/Wheeler Cap, and Almeda Cap. See presentation here. Neighborhood Task Force, including Museum Park representatives Pam Campbell and Barbara McGuffey along with representatives from Midtown Super Neighborhood and EADO, met March 21 with Mike Nichols, Interim President/CEO at Coalition for the Homeless. While the Wheeler Encampment has been closed, the NTF will continue to engage and assist where possible in the ongoing process to address homeless issues. See notes from that meeting. Treasurer’s Report: Current Balance, $25,280. Green Team Garage Sale on March 23 was a success and netted $1067. Proceeds will be used to offset costs of enhancing neighborhood green space. Community Champions program to install a Little Library in the neighborhood. Look for details in the near future. Community Engagement: MPNA in partnership with Covenant Church will host an Easter Egg Hunt on the lawn of the church, 4949 Caroline, Saturday, April 20, 10:00 a.m. Bring your children, your grandchildren, or just stop by to have a cup of coffee and watch the fun. Quality of Life & Infrastructure. QoL Committee needs volunteers to help plan community meetings to identify top priorities and progress following guidelines of the Livable Centers Study. If you are interested, contact Kim Mickelson at info@museumpark.org. Preservation Committee continues their work developing Main Street Memories, a retrospective exhibit opening at the Lawndale Art Center this fall. Volunteers are still needed. Contact Lynn Dahlberg to express your interest. 288 Sound Barrier Meeting, Thursday, April 11, 2019, Energy Institute High School, 3501 Southmore. Hermann Park will host a meeting for public input on the development of the upcoming Dog Park on Tuesday, April 9, 6:00 p.m. at the Cherie Flores Pavilion at Centennial Gardens. To Keep You Informed, March 6 Meeting update located here. February was the Bars Education Initiative - HPD initiated visits with bars to educate the owners on over-serving alcoholic beverages to patrons, noise ordinance, and the After Hours Task Force. March is designated MARCH ON CRIME and all convenience stores will be inspected for compliance with Robbery Ordinance Enforcement that requires public safety items, e.g., drop safe, digital cameras, panic alarms, height strip (to help assess height of robbery suspects) etc. Each inspection takes 1-2 hours and can be a tool for monitoring and closing down problem stores. Please email Sgt. Flores (eric.flores@houstonpolice.org) with concerns about any specific convenience stores. Sgt. Flores encouraged all to attend the March 19 PIP meeting at 7pm at HPD Station, 2202 St. Emanuel, 77003. Guest speaker is Harris County District Attorney Investigator, Chuck Cornelius, with the After-Hours Task Force who will be discussing the topic of bars/clubs over-serving alcoholic beverages to their patrons. Museum Park Crime Statistics – Overall crime is up 2%: The biggest increase is in Auto Theft, up from 3 in Feb 2018 to 13 in Feb 2019. *DRT: Differential Response Team members receive specialized training using non-traditional methods of police work. Metro’s Chena Karega detailed expansion plans to be funded by $7.5 Billion Bond Issue, which will appear on the November 2019 Ballot. These meetings are held to give the public an opportunity for input before plans are finalized. Attached is MPNA letter of support to MPSN comments for proposed ordinances. To review the current proposed ordinances along with public comments/responses from Parking Management, see PM website. Sandy Stevens announced that Brittani Flowers has volunteered to serve as MPNA Safety and Security Chair. The MPNA Board has unanimously approved Brittani to fill the unexpired term of this open position. Brittani has a Masters degree in Urban Planning from Texas State University (TSU) and we are fortunate to have her expertise on our MPNA Board. Brittani will initially focus on Almeda Corridor issues, as she lives adjacent to Almeda; while VP Pam Campbell will continue her focus on the Coalition for the Homeless, Neighborhood Task Force, and other Wheeler Corridor and Museum Park issues. Pre-design for the Caroline Promenade, a project outlined in Museum Park's Livable Centers Study, is currently underway. SWA, landscape architects for the project, will hold public meetings in the spring to gather input. Although the Caroline Promenade project did not receive implementation funding in the 2018 H-GAC grant awards, completion of the design will better position the project for future grants. Kim Mickelson (QoL Chair) recently reviewed variance request on the south side of Calumet@Chenevert with input from neighboring MPNA member. Because the variance request aligned with the goals of the Livable Centers Study and supported preservation efforts, MPNA did not protest the request, which was subsequently approved by the Planning Commission. Rice Management Team will present plans for the ION (former Sears Building) & the Innovation District. Captain Salim Zia, Sgt. Eric Flores, Sgt. Johnnie McGee, and Officer Nicole Simmons Tosh acknowledged MPNA’s support for the HPD South Central Division Community Service programs during 2018. MPNA Safety and Security Chair, Pam Campbell, accepted HPD’s plaque honoring MPNA. Our thanks and congratulations to Greg Quintero (MPNA Past President 2016) for volunteering to serve on the 2019 MPNA Board in the open position of Immediate Past President. Per the bylaws, MPNA members at the meeting unanimously elected Greg. MPNA participated in a Feb 4, 2019 meeting, organized by the Riverside Civic Association, to reopen the discussion with TXDOT regarding 288 Sound Barrier placement on both the east and west sides of the freeway. MPNA will continue to participate as these discussions move forward and the MPNA Board may be asked to evaluate, propose, and support new solutions requested. Update, Austin/LaBranch/Crawford Bikeway Project: Bikeways will slow traffic on affected Museum Park streets according to Geoff Carlton of Traffic Engineers Inc. Plans for safe crossing measures at Hermann Dr./Crawford are under discussion. Parking in Museum Park will not be impacted. Bicycles and vehicles will share the road using signage to indicate a bikeway. Details here. Update, Museum Park Community Parking Plan and Parking Benefit District ordinances will open for public comment on Feb 11 for a 30 Day period. For more details and to add your input, see ParkHouston. Pam Campbell and Barbara McGuffey, will continue to participate as MPNA representatives on the Neighborhood Task Force (NTF) with the Coalition for the Homeless. While the Wheeler Encampment has been closed, the NTF will engage and assist where possible in the ongoing process to address homeless issues. Although Marilyn Brown is no longer with the Coalition, the NTF has been invited to meet with the newly announced Coalition Interim President/CEO, Mike Nichols. 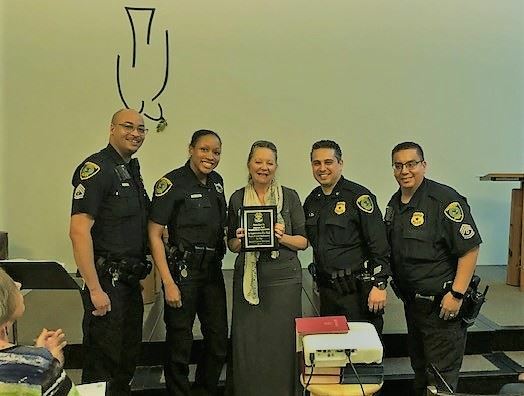 Museum Park Neighborhood Association was honored by the Houston Police Department's South Central Division at the February 6 meeting. South Central recognized MPNA for their support of HPD outreach programs including their Easter, Back-to-School, Halloween, and Christmas programs throughout 2019. Pictured are Sgt. Johnnie McGee, Sgt. Nicole Tosh, MPNA Safety & Security Chair Pam Campbell, Captain Salam Zia, and Sgt. Eric Flores. Since the closure of the Wheeler encampment on November 2, HPD and the Coalition for the Homeless continue their outreach efforts to offer social services and housing to the homeless in our area. They have requested our help in finding those individuals who are now living in scattered pockets throughout the area. If you see individuals who appear to be living on the street and may benefit from this outreach effort, please email the location and a photo if possible to healthandsafety@museumparkna.org. We will forward the information you provide to HPD and the Coalition for the Homeless. Errata: In the November 13 At Work on Your Behalf, the Houston Chronicle article was incorrectly linked to November 2 article rather than the November 5 article regarding neighborhood reaction to closure. As you know the Wheeler Encampment was closed and fenced Friday, November 2. This closure came after MPNA advocated for more than two years with city officials, the Houston Police Department, the Coalition for the Homeless, and other agencies; work that resulted in a compassionate solution for a complex issue. Achieving this solution has not just been the work of one organization, one agency, or one city department. Many of you in the neighborhood spoke up, met with officials, sent emails, attended meetings; thank you for your activism, patience, compassion, perseverance, and support of MPNA as together we worked for solutions. MPNA has sent a letter of thanks to Mayor Turner citing individuals who supported our neighborhood unfailingly: CM Dwight Boykins, Marc Eichenbaum of the Office on Homeless Initiatives, HPD Sergeants Eric Flores and Shannon Farquhar, and Marilyn Brown, President of the Coalition for the Homeless. Thanks also to the Museum Park Super Neighborhood, Houston Southeast Management District, Midtown Management District, and too many more to name. MPNA extends a special thank-you to the Coalition for the Homeless who worked with the Neighborhood Task Force including MPNA Board members, Barbara McGuffey and Pam Campbell to find solutions. Marilyn Brown acted on the Task Force’s request to identify the Wheeler Encampment as the initial pilot project in the Coalition’s goal to develop a plan to resolve issues of encampments throughout Houston. The Coalition believes that the success of this initiative can now be modified and replicated throughout Houston. The Coalition for the Homeless knows that after the re-purposing of the Wheeler encampment for bus parking, former encampment residents may move to other areas of the neighborhood. You can help by noting the location of someone experiencing homelessness, and e-mailing that information to healthandsafety@museumparkna.org. That information will be forwarded to the Coalition in order that Navigators can assist those individuals in finding bridge or even permanent housing. For additional details, please see the Coalition’s November 8 report. Sgt. Flores is communicating with the Coalition Navigators in efforts to locate and offer assistance to those who chose not to accept bridge housing November 2. TXDOT is expected to complete fencing under US59/I69 to Almeda. HPD had anticipated it to be completed by November 2 and is following up to get an update. Sgt. Flores met Wed, November 7 with the owner of the vacant lot(s) at the corner of Caroline/Wheeler to address the accumulation of property and individuals on those properties since the Wheeler Encampment closure. The owner has now filed Trespass Affidavits and will be taking other measures within the next two weeks to secure the property. If you are concerned about trespassers on your property during your absence, please go by the HPD South Central Station, 2202 St. Emmanuel, to discuss your concerns. If you decide to give HPD the authority to remove trespassers in your absence, you must have an affidavit on file and post No Trespassing signage on your property. Attached are forms for residential and business properties. Both pages of the affidavit must be completed. HPD will assist you and notarize the document. Please note: you can call HPD at any time to report trespassers on your property and file a complaint to have them removed. If you didn’t catch the Chronicle’s report on the closure of the Wheeler encampment, be sure to see what they learned when they reached out to get the neighborhood perspective from MPNA VP Barbara McGuffey. The article also includes input from Marc Eichenbaum and Eva Thibaudeau of the Coalition for the Homeless. MPNA has had ongoing concerns regarding the $572,115 repayment plan for the December 30, 2008 Holocaust Museum of Houston (HMH) purchase of Calumet Right of Way (ROW), abandoning one block of Calumet from Caroline to Austin. The MPNA Board has continued to engage with the City and HMH to address our concerns and the City agreed in January 2018 to abandon their initial plans to close the north two lanes of Calumet from Caroline to San Jacinto. Both MPSN and MPNA continue to ask that the City and HMH revisit current plans in order to provide more investment in the public realm to further the goals of the Livable Centers Study (LCS); however, neither the City of Houston nor HMH have indicated a willingness to pursue any further changes. The MPNA Board initially believed these matters could be mutually resolved as we discussed our concerns with CM Boykins, issued a Resolution sent along with a letter to Mayor Turner on December 18, 2017 (see attachments), and continued conversations with the City and HMH to address these issues on behalf of the neighborhood. The City has not agreed to our request contained in the Resolution that Council direct a new Ordinance be prepared for funding and development in the public realm of the Museum Park neighborhood, in consultation with the Museum Park Super Neighborhood (MPSN), MPNA board, and Museum Park residents. Below are further details regarding the history of this sale of public right of way by the City to HMH, the actions taken by MPSN/MPNA, and the current status of the repayment plan. At the five-year deadline, when HMH had not acquired the matching grant funds, City Council granted a three-year extension of payment. When payment again became due in 2016, City Council approved a very different repayment agreement. Neither MPSN nor MPNA were notified of the modified repayment agreement at the time, but coincidentally became aware when HMH made a public announcement of its expansion project in June 2017. MPNA began to voice objections to the City of Houston regarding the terms of the revised repayment plan, particularly pertaining to funds no longer being required to be deposited in cash into a special City account. HMH investing $300,000 into its expansion plans to improve the interior landscape by creating the Garden of the Righteous, which is open to HMH members/ticket holders only during the Museum’s hours of operation. Abandoning more public ROW (the two north lanes of Calumet west of Caroline) to extend the grounds of the Clayton Library and make improvements totaling the remaining $272,115, without any compensation to the public for the additional abandoned public right of way. Timeline of Actions: City Council & MPSN/MPNA regarding HMH purchase 1300 Calumet. Wheeler Encampment: Marilyn Brown, President and CEO of Coalition for the Homeless Houston, www.homelesshouston.org, has provided a recent update regarding Coalition efforts to secure permanent supportive housing for those living in the Wheeler Encampment. Please see here for full report and go to www.thewayhomehouston.org for additional information on best ways to donate/help the homeless in our community. Follow The Way Home Houston FaceBook page for more updates. Second Cap Park Public Meeting: July 17, 6:00 - 7:30pm, Midtown Offices, 410 Pierce Street. Please attend this very important meeting regarding changes that significantly impact Museum Park Neighborhood. This is your opportunity to learn more about the plans for the Cap Parks, which will be installed across US59/I69 as part of the North Houston Highway Improvement Project. You will see the latest design plans and have an opportunity to share your own ideas. Please attend…this is our future. Proposed Community Parking Plan: Additional meetings to discuss the proposed Community Parking Plan have been scheduled for August. MPNA will provide meeting details as information become available. Please continue to submit any questions, comments, concerns, requests, etc. via email to parking@houstontx.gov. Hermann Drive Pedestrian Safety Concerns: A growing sense of concern for the safety of residents and visitors crossing Hermann Drive has arisen in recent conversations among neighbors, at the spring Quality of Life Committee meeting, and at MPNA Board meetings. As residents of Museum Park, we frequently see/experience incidents along Hermann Drive that should be reported to the City of Houston. If you want to share your concerns with specific stories, pictures, and street intersections, please do so with a note to city officials, jeffrey.weatherford@houstontx.gov and ian.hlavacek@houstontx.gov. Noise issues: If you or a neighbor have concerns regarding noise coming from bars near you, please send an email noting your concerns along with your contact information to info@museumparkna.org. Other Neighborhood Associations from this area have formed a group to address these concerns. Please let us know if you want to get more involved in working with them to find solutions. Wheeler Encampment. Marilyn Brown, President and CEO of Coalition for the Homeless Houston (www.homelesshouston.org), presented an update about the Coalition efforts to secure permanent supportive housing for those living in the Wheeler Encampment. Please see link here for full report and go to www.thewayhomehouston.org for additional information on best ways to donate/help the homeless in our community. Follow The Way Home Houston FaceBook page for more updates. 311 Presentation. Isaiah Monroe and Pamela Scott from 311 gave a presentation about the 311 system for reporting and resolving problems noted in our neighborhood. They emphasized that 311 can be used to report almost anything or to simply get information. Website www.houston311.org where you can submit a problem or check to see what problems have already been reported. Hover over the red dot on the map to see details or status. 311 App: Download the 311 app for iphone or android and use the app to submit a problem. Call 311 and talk to a 311 operator. Problems can be reported anonymously or you can provide your email address to have the case #/report emailed to you, which will allow you to follow the progress/completion. If you have a question, just call 311 to get an answer! Hermann Drive Pedestrian Safety Concerns. A growing sense of concern for the safety of residents and visitors crossing Hermann Drive has arisen in recent conversations among neighbors, at the spring Quality of Life Committee meeting, and at MPNA Board meetings. As residents of Museum Park, we frequently see/experience incidents along Hermann Drive that should be reported to the City of Houston. If you want to share your concerns with specific stories, pictures, and any specific street intersection, please do so with a note to city officials listed here. Noise issues. If you or a neighbor have concerns regarding noise coming from bars near you, please send an email noting your concerns along with your contact information to info@museumparkna.org. Other Neighborhood Associations from this area have formed a group to address these concerns. Please let us know if you want to get more involved in working with them to find solutions. City of Houston’s Planning and Development Department is leading a planning effort focusing on the opportunity to create one or more “cap parks” that support surrounding development in lower Midtown in conjunction with TxDOT’s planned reconstruction of I-69. We are pleased to invite you (see invitation here) to participate in the first public programming workshop for the proposed new cap park. See the plans give your input at this meeting. To see 3D visualization of cap park and North 45 Freeway Improvement Project, see here.